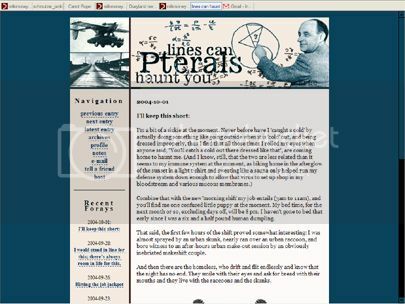 When I joined Diaryland, I had no idea what html was or how to use Photoshop. I had never used a scanner and had yet to discover the joys of using an optical mouse. What I did have was creative energy that needed to be spent and the Fiery One, who made it all possible by downloading programs and bringing home all the tech stuff and keeping this computer operational. I can be a little obsessive, so it is not uncommon to find me hunched over the keyboard, eyes red and unblinking, working on some graphic or a chunk of html. After spending a year teaching myself the basics mostly through trial and error, I have something to show for all my bouts of frustration and late nights. 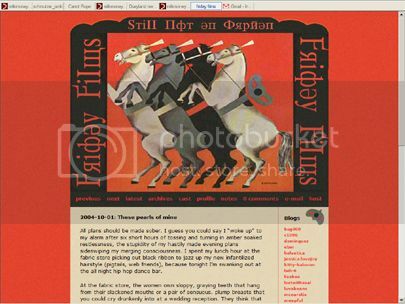 So far, I have made three weblog templates for friends of mine. I feel overjoyed when someone likes something I make, whether it is here online or out there in the physical world, and since I just finished creating my favourite design yet, I thought I would take a moment to pat myself on the back in the most public way I know how. It’s kind of like I’m five and I’m putting my art up on the refrigerator. 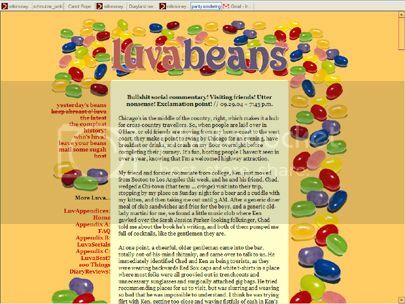 In order, the following are: Luvabeans, Pterals, and Friday Films. It was a sunny afternoon, and I was six years old. My mother had sent me down the street to call on my friend, Patricia. I wasn’t really in the mood to play with her, but I had gone through the motions of walking down the street to her house, occasionally turning my head to see my mother standing on the front step, waving and watching my progress. I took my time kicking rocks on her driveway and leaning against a fence before I decided to ring the doorbell. I was quite small, and so I had to strain a bit to reach the high button. As I was straining upward, I looked down to my right. A breeze had moved something near the ground that had caught my eye. Tulips. I was filled with that horrible sense of things gone wrong; it was one of those moments when the world seems to have shifted slightly out of position, and you can’t put your finger on what it is; at such moments, the world becomes menacing, sardonic, sentient. The violence of their red and the sharp, black insides hidden by stiff petals filled me with dread. As in dreams when your legs are leaden, I was glued in this fixed stance, one chubby arm stretched upward to a bell I could not push, eyes cast downward to a group of tulips I could not contend. Ever since, I have hated tulips. And red flowers are not my favourite, either. 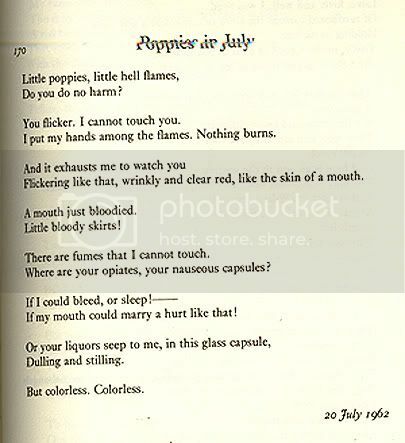 Here is a poem about poppies. (What? That was a perfectly acceptable segue. I swear). I always thought hot tubs were disgusting. Saunas aren’t so safe, either. I love Photobucket. They host my pictures, which in turn allows me a greater degree of self-backpatting.